If you ever observed the traditional textiles of Romania, they have strong woven or embroidered floral patterns, as you’ve probably noticed already. Roses and peonies are the most popular and prevalent motifs on tapestry, rugs, table runners, waist belts and Romanian peasant blouses from the region of Bucovina. Looking back to the traditional designs in the early 20th century, they were predominantly geometric, sometimes combined with abstract geometric vegetal and floral patterns, stylized avian (birds) or anthropomorphous motifs (human figures). But the floral designs that we are used to see today are nowhere to be found. In his book, Romanian Folk Art in Bucovina, researcher Tancred Bănățeanu mentions these designs as a late addition to the Bucovinean textiles. Who Brought the Woven and Embroidered Floral Patterns to Rural Romania? Soon, the new influence on tapestry weaving would have an impact on other woven and embroidered textiles, which continues even today. Bukovina is dressed up with flowers. 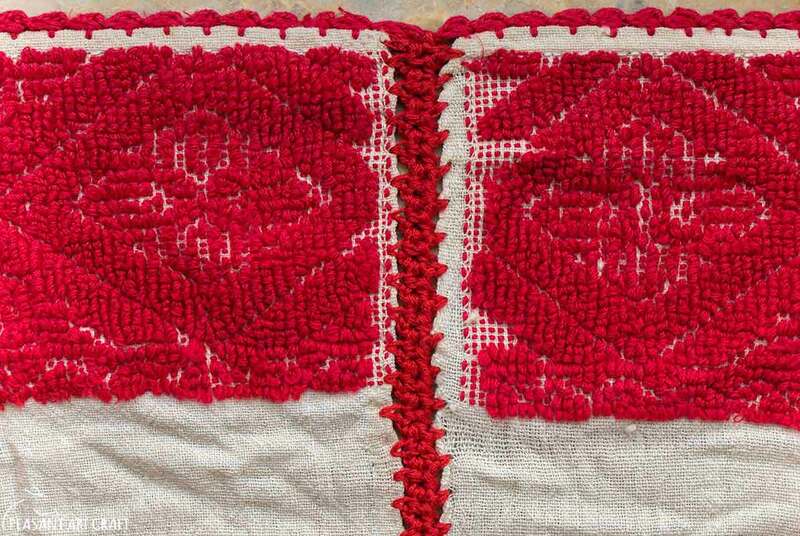 These motifs can be found on peasant blouses in an astonishing variation of combinations, colors, shades and distribution of the ornamental field. I was curious to see where did they come from? They surely must have been borrowed from somewhere or through something. So I looked to the North, to see if our Ukrainian neighbors have something to do with it and I found striking similarities between their floral embroideries and ours. With only a few differences in size and distribution, the motifs are shockingly similar. The embroidered motifs on the Ukrainian peasant blouses are notably bigger than the beaded floral patterns on Romanian peasant blouses from Bucovina. While most of the Romanian peasant blouses have their sleeves embellished with oblique or vertical rows of embroidery and are structured with altiță – shoulder ornament – and încreț – the horizontal row across the shoulder, the Ukrainian blouses have their sleeves completely covered in beads and prominent ornament over the chest. Curiously enough, the Ukrainians are also stating that this “is not a traditional form of embroidery in Ukraine” either. Trying to explain the true origins of the roses, Roman from folkcostumes.blogspot.ro has an interesting theory. These designs, he says, were being promulgated widely within the western Russian Empire. So the Russian Empire could be the source of origin for these woven and embroidered floral patterns and it makes sense if we look at the Russian babushka shawls. We can observe the same motifs that appear on many Bukovinean textiles. It is possible that these babushka shawls were the principal source of inspiration for the creation of a new traditional fashion trend among Bukovineans.